High performance companies can predict current quarter revenue within 10% on day one. This includes in quarter adjustments for both upside gains and forecast misses. Given the roles of those that responded to this survey, we recognize the responses to be quite accurate. Forecast inaccuracies result in an excess expenditure of effort by executives, sales management, sales ops, and finance to successfully manage company results. In general, the recommendation for improving opportunity management and forecast accuracy is to ensure that people, process and systems focus sales efforts on the right opportunities, at the right price, with the right customer aligned value, at the right close date. High performance companies close greater than 90 percent of opportunities as originally forecasted. Value is aligned to the buyers expectation so that the opportunity closes in the right quarter at the right price. Respondents to this survey show that 93% of deals have significant changes in close date and amount. An accurate close date and amount is dependent upon many factors: understanding the optimal customer profile, supporting opportunities with the right ‘value engineering’ aligned to the buyer’s journey, and a sales process that is rigorously defined and followed. Only 8% of more than 1,400 companies analyzed meet or exceed quota quarter after quarter. 50% of respondents were in the underperformer quadrant on this question. Growing the number of leads/new customers is the leading sales objective for sales professionals. Here we see the most important sales objectives, ranked by sales professionals, over the next 12—18 months. While half of sales reps report relationship building as their favorite activity, most are too bogged down by day-to-day tasks to engage with customers as much as they’d like. On average, sales reps spend 64% of their time on non-selling tasks. Day-to-day sales process is still plagued by time-consuming administrative tasks, siloed customer information, and outdated management systems. If sales reps aren’t armed with capabilities at least as sophisticated as those of their customers, they risk continually falling short of customer demands. Although adoption has been slow, across performance levels, strong growth is expected for the following intelligent selling capabilities over the next three years. Here we see the percentage of sales professionals who use each intelligent selling capability by performance. On average, sales teams rate six channels as absolutely critical/very important for connecting with customers — nothing yet eclipses the impact of a human conversation. While many may imagine a world where technology replaces reps entirely, data shows that the desire for 1:1 human connection is still more powerful than technology innovation for its own sake. 2/3’s of consumers, and 72% of business buyers say they are likely to switch brands if they’re treated like a number instead of an individual. 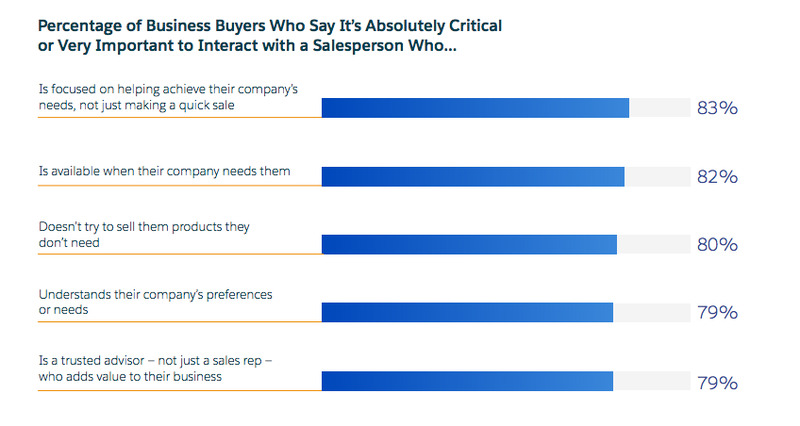 Customers want sales reps who are personal consultants. Seventy-nine percent of business buyers say it is absolutely critical or very important to interact with a salesperson who is a trusted advisor — not just a sales rep — who adds value to their business. Regarding geographic participation, 53.9% of the firms are based in the United States and 46.1% are international. By way of size, 12.6% of the firms have revenues of greater than $1B, 21.9% are in the $51M – $1B range, and 65.5% of the companies have revenues of ≤$50M. The following is a summarization of the four levels of sales process. Level 1—Random Process: A company may be perceived as being anti-process, although what it really lacks is a single standard process. Essentially salespeople do their own thing their own way. Level 2—Informal Process: A company exposes its salespeople to a sales process and indicates that they are expected to use it, but its use is neither monitored nor measured. Level 3—Formal Process: A company regularly enforces the use of a defined sales process (sometimes religiously), conducts periodic reviews of the process to determine its effectiveness, and makes changes based on the analysis. salespeople’s use of its formal sales process. It also proactively and continually modifies the process when changes in market conditions are detected. Above summarizes the top three objectives for 2016 for companies are planning to achieve their revenue goals. In terms of sales execution challenges, 53% stated that the inability to generate qualified leads is the number one challenge for sales organizations. In this go to market chart for sales, the largest sales forces in the world. SBI ranked companies by the size of their total B2B sales population. In this go to market chart, the cost of a fully burdened sales resource is estimated. To calculate the investment in sales, SBI measured the average fully burdened cost of a sales employee multiplied by the size of the sales force. In this go to market chart for sales, SBI calculated the investment in the support structure for their large, complex sales organizations. In this go to market chart for sales,the SBI firms with the lowest sales productivity appear to invest significantly less in operations and 2X as much in presales and sales engineers. However, 50% of the bottom 10 firms are software providers and they typically have a heavy reliance on presales and engineering. In short, there is no one size-fits-all formula to determine the optimal quantity and allocation of support resources for a sales force. In this go to market chart for sales, the need to invest in sales effectiveness is illustrated. Some CEOs and board’s view everything but selling a pure cost with no contribution to revenue. SBI’s findings indicate that companies with effective sales forces invest heavily in 2 areas: 1) 50% of the sales effectiveness budget is spent on hiring and developing people; 2) the other 50% is spent on placing these people into winning performance conditions. In this go to market sales chart, the point that before a sales organization can make any strategic decision it’s critical to understand where you stand – your starting place (point A) is made. Then, you can determine where you want to go (point B) and devise a plan on how to get there. This is the process that should be followed to determine whether to invest in a new sales model, adjusting headcount, or changing sales compensation. In this go to market chart for sales, the Periodic Table of SaaS Sales Metrics produced by Insight Venture Partners is presented. Included in the go to market sales chart are sales quota and contribution metrics for Sales Development and Inside Sales. It also lists the top challenges faced.